Williams College desired an early education center that would forward their mission “to educate toward the capacity to explore widely and deeply, think critically, reason empirically, express clearly, and connect ideas creatively.” Through thoughtful master planning, site selection and design, a center was developed that creates connections between the parents and staff, teachers and students, classrooms and natural surroundings, the center and the college. Beautifully sited, the new center inspires exploration both within and without. This new center was designed after a comprehensive site selection process D. W. Arthur Associates conducted with the college. The site was selected because of its combined qualities of being ideal for the development of an extended natural play environment and its proximity to campus. 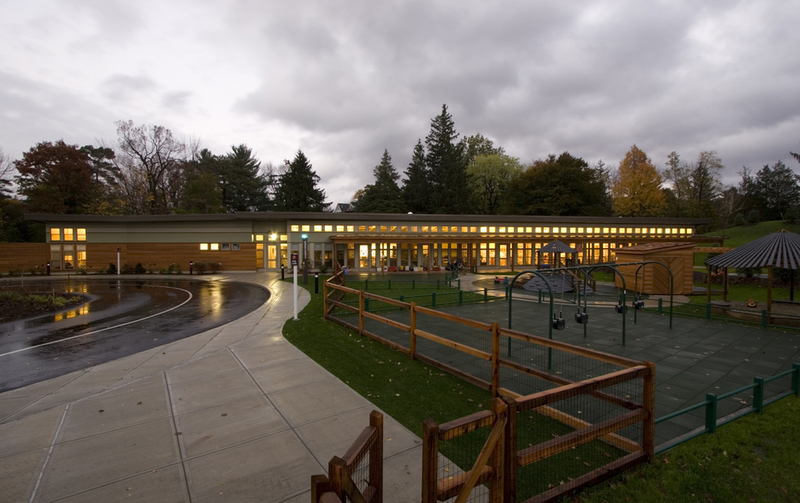 The building was sited at the northern edge of the property to maximize the outdoor play area, and the playgrounds were carefully designed to preserve and take advantage of the existing mature trees. A primary design driver was the preference to create a place where children would have the opportunities to roam and explore at a distance far greater than in typical playgrounds, and to experience a substantial amount of natural landscape variation. The site encompasses a local height-of-land overlooking the Taconic Range of mountains to the west. Significant topographic variation and a mix of mature vegetation and open meadows add to the character. The design endeavored to maintain much of the preexisting landscape qualities while enhancing certain aspects for the early education program. The more traditional parts of the playgrounds (climbing equipment, etc.) are situated closest to the building, and beyond are open grass fields, copses of trees, planting beds, and other more natural features. In one area, the topography has been shaped to create an amphitheater/bowl, and elsewhere a sledding hill. The design intent was that these more extended areas will evolve over time and take on a life organic to the children’s center program, and ultimately provide children with a sense of delight in exploring a realm that constitutes a microcosm of the greater world. In support of this intention to maximize connections to nature, the building is organized as a linear sequence of classrooms, all opening to the south onto the expansive outdoor play areas. A simple mono-pitch roof slopes up to allow for high clerestory windows, admitting daylight deep into the interior along the wood ceiling. This strategy allowed for the inclusion of a deep porch along the entire south side without compromising the daylighting of the rooms. The porch is covered with a translucent roof material, allowing diffuse light onto the porch and adjacent classrooms. 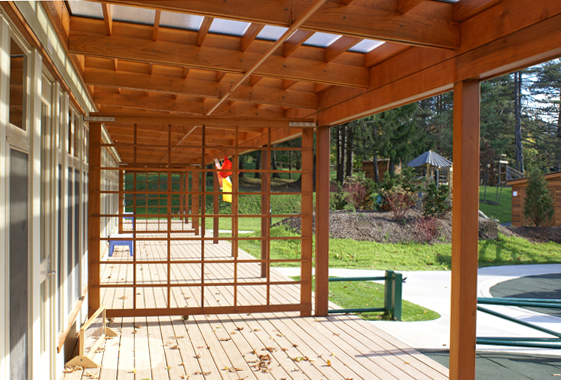 This 120-foot-long porch provides an ample amount of "outdoor classroom" area for messy and creative play, a natural science curriculum, and other activities. It also serves as a valuable transition space, a sort of “mud room” for the nearly continual movement of children between the worlds of the indoors and the outdoors. At the interior, the circulation accessing the classrooms is configured to provide alcoves and eddies near classroom entrances. These spaces assist with the daily transitions for children and families coming from home. A series of light scoops along this play gallery are finished with pigmented plywood to animate the interior spaces with warm colors. 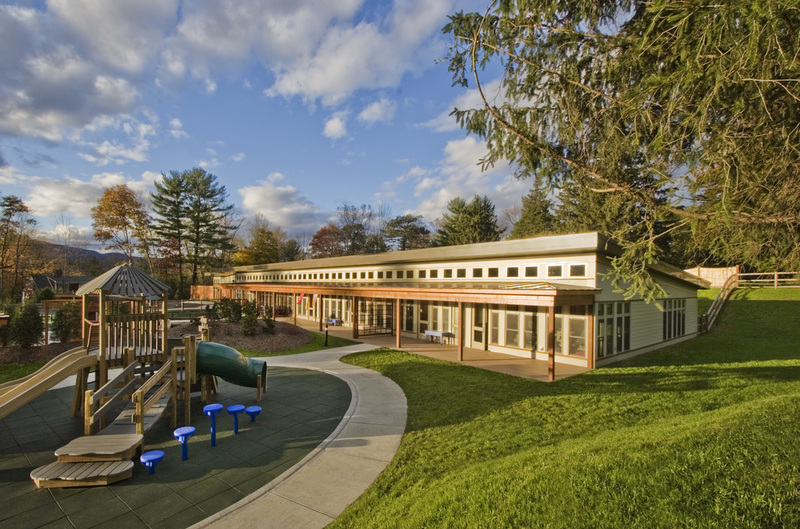 The massing of the building was devised so that the main entrance is flanked by the linear classroom “bar” and a school-age and multi-purpose activity play space pavilion. This volume is articulated with a long red cedar clapboard wall which is inflected and extends beyond the building perimeter to screen the mechanical and trash services area. This more opaque façade terminates the vehicular approach and balances the more transparent expanse of classrooms at the playgrounds.